I love this poem. There was a bit of cleansing involved in the way it was written, and in that sense I find a similar relief in editing it. This is another good example of the sonnet as an indicator of control. We always want that poetic control. You write the poem, whatever it becomes; you shape it with your own intentions. Don’t let a 14 line poem just lay there. This is a broken sonnet. The middle broken line indicates that there is at least some intention there. Had there been no indentation, the poem would have appeared haphazard, even accidentally enlightened. In poetry there are no accidents, only strong decisions that become truth. Not a real sonnet, the broken sonnet designates some break-away from tradition but maintains a connection with the essence of poetic forms. That essence: the heroic couplet, the turn the moral, the lesson, all that is present here. There are a few stray lines of course, but the essence belongs in the sonnet category and that is why the form was not traded in for a free-er model. Consider your broken sonnets an evolution of form and not a divergence. Think of your work as a growing version of what came before. And never let a 14 line poem sit. That is what caught me on my first editing of this poem and it is what bothers me still. It’s either a sonnet or it needs more, or needs less or needs a line break. Remember the heritage you earn as poet. Remember everything that came before to give you this poetic freedom, and do what you can to respect it. The sonnet, a poetic powerhouse, may not have the following it once had, but should be remembered all the same. 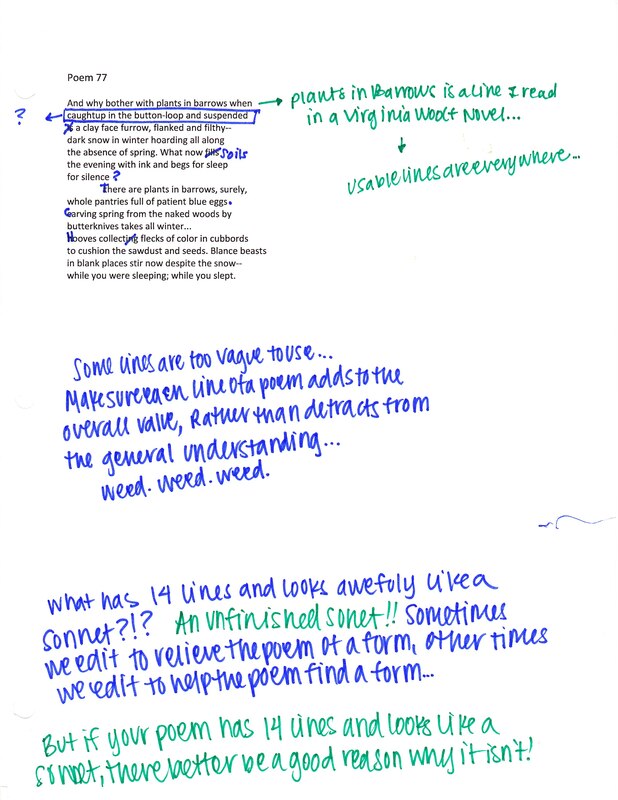 I spoke before about the sonnet as a tool for editing, and how it may be used to discover the natural tendency of your writing. This poem, a sonnet at its core, does not need to be formed or broken, but instead needs to better fit into the sonnet tradition. There were a few lines that I tweaked, a few words that improved, but in further versions, I will simply work to braid it into the sonnet (broken or whole) that it must become. Let the poem guide you, but always be in control. There is no reason to force a piece against its natural tendencies, but at the end of the day, a good poem has no mistakes, no carelessness. It is the most reduced, concentrated, intentional form of language, and in order to respect that, we must as poets strive for perfection in all ways. Whether that is intentional departure from tradition or a mere exposure of inner Truth, there are ways to control even the most unruly poems, and that is a skill only the greats can boast. For this poem, choices like the broken line 7/8 and the semi couplet in the final line pay homage to a longstanding tradition while emphasizing freedoms under my own pen.